Three-quarters of Britons believe wind farms are necessary to help meet demand for energy, a survey by the British Wind Energy Association suggests. The body claims the vast majority of the public feels the need for clean sources of renewable energy. The study also suggests 70% of those polled would support the creation of a wind farm in their area. But opponents of wind farms say they are unsightly and point out that wind is an unreliable source of power. Two surveys have been merged into the study: one by World survey on behalf of BWEA, and one by ICM Research on behalf of Greenpeace. Both polls were carried out in the month of August, each involving 1,000 adults. A range of celebrities from the worlds of design, music and the media support the BWEA's campaign. BWEA chief executive, Marcus Rand, said: "Time is running out on climate change and wind power is essential to averting its potential impacts. "Britain has the best wind resource in Europe - it's everlasting, on our doorstep and ready to use now. "By embracing wind, we will increase our nation's energy security and create thousands of new jobs in Britain, but we need to act now." He added that the campaign aimed to challenge the myths and prejudices about wind turbines, and show that the majority of the public welcome the spread of this clean source of energy. 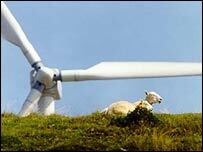 Members of the public will be able to sign a petition at the Embrace The Revolution website, and the names of every supporter will go on four new turbines to be set up in 2005. The architects behind the London Eye, David Marks and Julia Barfield, said they believed the current wind turbine technology represented "the best environmentally sustainable and economically viable source of renewable energy". "That is why we are actively exploring ways to incorporate wind turbines within landmark buildings that we are designing today," they added. But wind energy has vocal opponents, too. 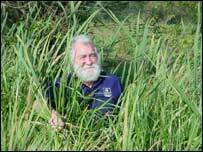 TV botanist David Bellamy recently led a march in south Wales to oppose plans to build wind turbines on a mountain. The protest was led by campaigning group Save Our Common Mountain Environment (Socme), which claims that wind farms will push up energy prices and that they ruin landscapes and kill birds and bats. They also say that wind is an unpredictable and therefore unreliable source of power, and that turbines can be damaged or even knocked down by storms. The chair of campaign group Country Guardian, Angela Kelly, told BBC News Online: "Most of the public have not studied the facts. "But the more the public discover the truth about wind farms, the less they want them. "The Achilles' heel of wind power is you cannot predict it even 10 minutes in advance, so it has to be backed up at all times by a secure supply of electricity and you cannot afford to shut down any existing power plants. "We already have more than 1,100 wind turbines in this country and they do not even produce enough juice to run one factory. "The power generated is at such a high cost that it is only economically viable by virtue of a package of subsidies that, according to official figures, will be worth £1bn in 10 years' time. "This must be found from the consumer to boost the profits of a few multinational corporations and shrewd investors." Ms Kelly added: "I am not prepared to see inappropriate and unnecessary industrialisation reduce the UK's unique and varying landscape to a common denominator of cloned mechanical monsters." But some local communities have reacted positively to the introduction of the turbines. Margaret Munn, a councillor in Ardrossan, Ayrshire, said her community had "overwhelmingly accepted" a new wind farm. "Instead of spoiling the landscape, we believe it has been enhanced," she said. "The turbines are impressive-looking, bring a calming effect to the town and, contrary to the belief that they would be noisy, we have found them to be silent workhorses."